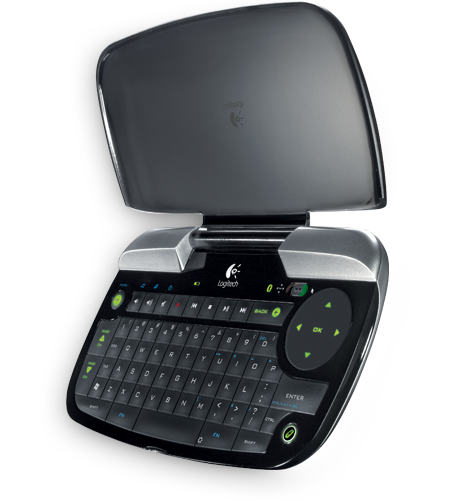 I’ve been using a Logitech diNovo Mini keyboard to control my home entertainment system, a Mac Mini, for the last few weeks, and I love it. The diNovo Mini is small, only about 6″ wide by 3″ high with the cover closed – about the size of a Hewlett Packard financial calculator, with keys sized a bit larger than a Blackberry or a Sidekick. It has all of the standard keys of a QWERTY keyboard, plus Ctrl, Shift, Alt, and Super (Windows) keys. It also has standard media controls, including volume, pause/play, previous, next, and stop buttons for controlling apps like iTunes, Windows Media Player, or VLC. Although it lists Windows operating systems under system requirements, the unit works perfectly with Mac OS 10.6, and, while I haven’t tested it, I bet it would be fine with most Linux distros as well. What I found most useful about the unit was the combination trackpad/arrow keys in the upper left of the device. A toggle switch allows you to turn the circular trackpad (like the rectangular ones you find on notebook PCs) into a cursor pad not unlike what you find on video game controllers (instead of the traditional four directional arrow keys). It takes a little getting used to, but is fairly easy to grasp after a few minutes of playing with the device. While I certainly won’t be composing any long audit responses, doing graphics manipulation or programming with this for any significant length of time, it’s ideal for controlling a media center PC, light web surfing, or replying to a quick email – anything you might do on a smartphone or even a netbook. The unit has excellent range, allowing me to control my PC via its Bluetooth connection from anywhere in the living room. It also has a built in rechargeable battery, and a 3 year hardware warranty, so no more wasting disposable batteries for the remote control. The diNovo Mini retails for $149, but can can be found cheaper at various online retailers.